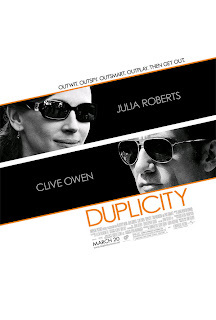 Julia Roberts working for the CIA and Clive Owen working for MI6 play competing undercover corporate high level top secret business spies who may or may not be conning each other. The movie shows us what lengths mega corporations will try and go to keep their new product information out of the hands of their competitors. The spies in this case will not even acknowledge their relationship as a sly parallel to regular relationships. The implication here is that most people do not say or trust themselves in relationships, but as spies Julia and Clive have good reason to be wary. Multi continent travels, many plot twists and counter twists follow. The music is light locations are beautiful and evokes the Ocean's movies and fun is had by all even if you can't always follow the plot.